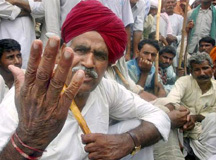 Jaipur,May 28 :The situation in the districts affected by the Gujjar agitation in Rajasthan continues to be tense though no fresh incident of violence was reported today. The State Government has already invoked National Security Act (NSA) in 15 affected districts. AIR correspondent reports that rail and road traffic continue to be disrupted at Jaipur-Agra and Delhi-Mumbai routes. 13 trains have been cancelled including Howrah-Jodhpur, Jaipur-Gwalior and Nizamuddin-Udaipur Express. Over 1000 State Roadways buses are off the road. The son of the Rajasthan Panchayati Raj Minister, Mr.Kalu Lal Gurjar was arrested in Bheelwara district today in connection with the agitation. There has been no response so far from the Gujjar leadership to the Rajasthan Chief Minister’s appeal that they should shun violence and resolve the issue through dialogue. The Center has issued fresh advisory to Uttar Pradesh, Haryana and National Capital Region of Delhi in view of Thursday’s Rasta Roko Call by the Gujjar community. Union Home Ministry has put the NCR region on high alert to prevent blockade of rail and road traffic. Traffic was affected today on the Mehrauli-Gurgaon and GT Karnal road. Police have deployed over 10,000 personnel across the national capital especially in Gujjar strong holds. The Prime Minister Office has referred the issue of reservation sought by Gujjars to the Law Ministry.